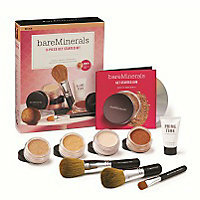 Bare Minerals are very well known for breaking into the market with healthy make-up. I have used Bare Minerals before and absolutely loved it. This is when they first became popular like two years ago and a box set was £40. Recently I have decided to repurchase it because I remember natural it looked on me back then. Today, I am the shade Golden Tan, which I think is too dark, but it is the lightest one in that range. So I am thinking about buying the lighter one and mixing them to make the perfect shade. Now there have always been talks about mineral make-up, especially with Bare Minerals. You can work out with it; you can take quick naps with it on and so on. These are all pretty much true, because they are minerals. They cannot do any harm to your skin or body. So go to the gym, and go for it, take a nap also. But be ready to retouch, and wash your pillow case, because a dirty pillow case can break you out. When you go to get colour matched, they ask you if you want more of a shimmery look or more matt. As I only like shimmer in my blush, I chose the matt option. Another reason whyI chose the Matt option is because I have oily skin. The starter kit comes with three brushes which I love. The Full Face Coverage is like a Kabuki on a stick. It is easy to manoeuvre, the bristles are (kind of) soft and it really does give good coverage. It’s almost impressive. 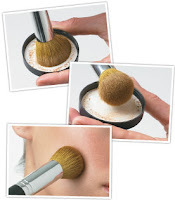 The flawless face brush is like a really thick and pressed together fan brush, made to bronze and contour. Its precision will help achieve a natural looking depth to the face. Another impressive tool in this box is the concealer brush. It is a usual make-up concealer brush that is used for liquid foundation. You will be impressed with that it can do with powder. It really hides the blemishes. Let’s move on to product now. What’s the first thing you do before applying foundation? Primer has become an important part of the make-up routine for a while now. I remember, the old kit didn't consist of the primer as it wasn't even invented then. But I do remember getting a bareVitamins Skin Rev-er Upper. I don’t remember what it does though. The innovation of primer allows our foundation to stay on longer. Other primers include the USP of either helping to lock in moisture, conceal blemishes and look better in photos. What Prime Time does is keep the foundation on for longer and keeps it looking natural. It is also what allows us to wear it through naps, at the gym and in the clubs. You will also be happy to know that it is SPF15. Moving on to the foundation. I know you think I missed a step, but the foundation is the concealer. Oh you already know that, didn't you? With the way that the concealer brush is made is that it allows us to conceal on a high level. The dark spots and pimples and the dark under eye circles will disappear. Well, it did for me. But I'm not sure how this product is for hiding wrinkles and anti-ageing but I know it works for my young skin. Hehehe. So I wear Golden Tan. It’s the lightest colour in the Tan range. When wanting to apply the foundation there is a technique which is used with all mineral make up kits. Swirl, Tap and Buff (as demonstrated in the picture). You pour the powder into the lid, take your full coverage brush or kabuki brush and swirl the brush into the product so that it is in the bristles. Tap off any excess powder. Save that product. Lastly, buff it into your skin LIGHTLY. The coverage is buildable and can still feel like there isn't a lot on your face. It is so light it may even feel weird, like you’re naked. But it’s good because, there is no harm to your skin and there is high coverage without having to feel conscious about lines, cakiness or smudging. And that’s the wonder of mineral make up. Let’s add some depth to your face now. Make it look more 3D rather than 2D. Warmth is a bronzer like product. Contour your face with that, and let your glowing-self highlight yourself. But if you do need additional help, I do recommend Benefits High Beam. But we’ll talk about that another time. So now, grab that flawless face brush, put some warmth in your lid and swirl, tap and don’t puff. You want to make a ‘3’ shape from your temple to the hollow of your cheek to you jaw line. This will add definition and depth to your face. And also make your face look a lot slimmer. It’s time to set that make up and add a beautiful glow. And this is the last step. Now first of all, I must mention that the mineral veil can be worn with or without the foundation. It is a beautiful, translucent powder that makes you look so ravishing in pictures. Brush the mineral veil lightly over your finished look using any brush you’d like (except the concealer brush) and now you are done. Enjoy the rest of your day looking naturally beautiful and blemish free. Now if anything I just said doesn't make any sense, there is an instructional DVD in every kit. So don’t you worry. To Buy: It’s a must have. Go out and get it.